Yemi Osinbajo on Tuesday in Abuja wondered how a certain Jibril from Sudan would be presiding over the Federal Executive Council (FEC) meeting. The misconception of Jibril, a purported body-double of President Muhammadu Buhari, has been rife in both conventional and social media lately. Buhari himself had while fielding questions in Poland, cleared the air and debunked the claims that he was cloned. Osinbajo expressed this shock at a National Consultative Forum organised by the National Committee of Buhari Support Groups (NCBSG) in collaboration with Council for New Nigeria Initiative. He said that the fear of Buhari was making some detractors lose their senses. 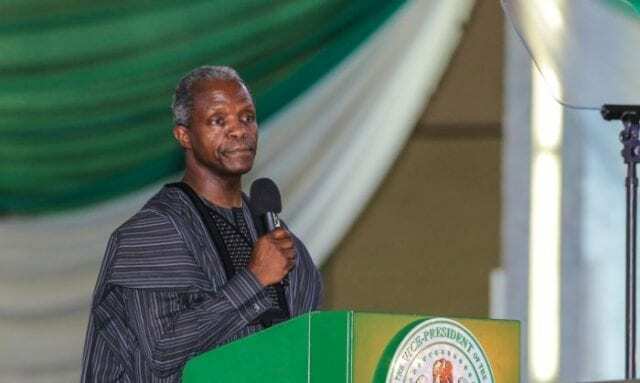 According to the vice president, the present government is earning 60 per cent less than the previous government, yet it has spent N2.7 trillion on infrastructure, the highest in the history of the country. Osinbajo said that the government was feeding over 9.2 million children every day; giving 2 million petty traders a better deal in life with Tradermoni and had employed 500,000 graduates under the N-Power programme. ”The fear of Buhari makes these people desperate even crazy. So now they say he is Jibrin from Sudan. If you can’t discredit him say he doesn’t exist; they were all alive and well when Pastor Adeboye went to London and prayed for him the day before he returned to Nigeria. He commended the members of National Commitee on Buhari Support Groups, saying that they were the vanguard of the battle for the soul of Nigeria.